19 Apr 2018 --- PreScouter, a Chicago based technology scouting company, details novel replacements for sugars in a new analysis, that are from natural sources, safe, technologically viable and environmentally stable, for use in beverages. 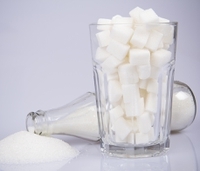 The company hopes that the report answers consumer calls for sweeteners that are both natural and healthy, in light of diabetes and obesity epidemics, and that it may aid informing beverage providers on how to best respond to calls for lowering sugar levels in drinks. The report was born out of a demand for natural, plant-based sweeteners, that represent “a growing market that will attract not only the diabetic population but the merging world of vegetarianism and veganism,” says Vasambal Manikkam, the researcher who compiled the report, “but first we must know they’re safe for consumers,” she adds. Consumers are indeed highly incentivized to buy products that have lower sugar claims. Innova Market Insights reported on a survey conducted by DSM among 8,000 consumers globally, which displayed that label reading has become the norm, with 50 percent of global consumers saying that they check the sugar content of foods before buying. The survey also found that 50 percent of women are more concerned about their sugar intake than they were three years ago; that 59 percent of consumers ages 26 to 35 always or almost always check the label for sugar content; and that 64 percent of people with children have researched the health risks of sugar (versus 55 percent of people without children). “Hopefully, this will be an emerging and innovative means that will add to the ongoing fight against childhood and adulthood obesity in the world,” adds Manikkam. Following is a summary of some of the significant factors in the report, regarding well-developed, emerging and lastly, innovative and up-and-coming ingredients that attempt to tick the box of plant-based and healthy sweeteners. The food industry is experienced in using stevia and monk fruit as natural, stable and high-intensity sweeteners which are recognized by the generally recognized as safe (GRAS), certificate. Both tout an extremely high level of sweetness, for example, monk fruit extract is said to be 150 to 200 times sweeter than sugar in powdered form, and 15 to 20 times sweeter in concentrated juice form. 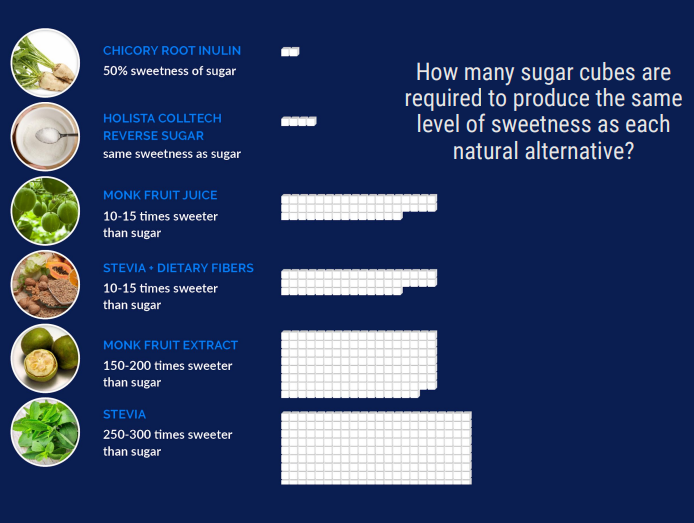 There have been over 800 products said to contain monk fruit sweetener since 2009, including beverages. Common monk fruit applications include dairy and dairy alternative based beverages, juice, flavored water and carbonated drinks. The HEYLO sweetener family, developed from a blend of stevia and dietary fibers, are already widely applied on the market and are utilized by food manufacturers. HEYLO was developed from a partnership between Unavoo and ED&F Man, and is predicted to be ready for private composition later this year. Said to be 10 to 15 times sweeter than sugar, HEYLO can tolerate high temperatures and acidity levels, holds some probiotics benefits and has a zero-glycemic index – making it safe for diabetics. transform simple sugars into some of the “better tasting” steviol glycosides. Cargill is using "specially crafted baker’s yeast" that can transform simple sugars into steviol glycosides, mimicking the process carried out by the stevia plant. Eversweet is clean label, also safe for diabetics and has worked successfully in applications such as soft drinks, iced tea, functional beverages, energy drinks, flavored waters and chocolate milk. Chicory root inulin and “modified” sugar from plant-based sources are the two key innovations in natural sugar-reduced solutions. Chicory root inulin is a low-intensity sweetener, providing up to 50 percent sweetness in the liquid form. Top players in this area include Cargill, CoSucra and Sensus. Modifying sugar is what Holista Colltech is attempting to do. It is hoped that chicory root could be utilized in smoothies, due to its creaminess profile, and also in soy drinks and flavored water due to its high solubility. Sensus, based in the Netherlands, markets two products called Frutafit Inulin and Frutalose ogliofructose, that are both derived from natural chicory root. Furthermore, Cargill also produces a chicory root based, clean-label sweetener, Oliggo-Fiber, which is already in use in the market across a range of beverage applications. Hollista tech, Australian biotech company, have reported working on two very promising sugar alternatives, both of plant origin (beetroot and sugarcane). 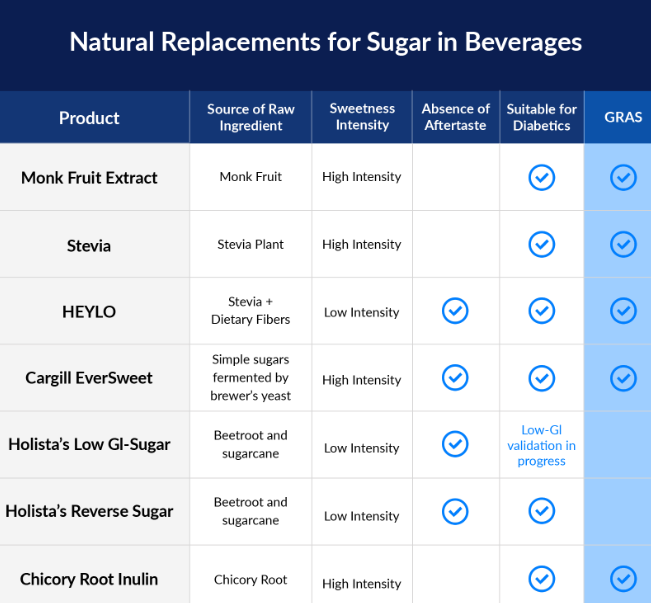 Firstly, Holista’s Reverse Sugar Sweetener is hoped to hit the market in June this year, touts zero-calorie status and suitability for diabetics. Secondly, Holista’s Low-GI sugar, has a patent filed for the world’s first low GI-sugar made of all natural ingredients and reduces the rate that glucose is digested in the body. Studies on the applicability and suitability of date extract (syrup) and date powders as an alternative to sugar have indicated significant potential for use as a natural sweetener. However, further research is expected to be necessary before any products may hit the market. The Prescouter investigation reports on a study that looked at whether date extract (syrup) could be utilized in food industries, such as soft drinks, candy and bakery products, to replace imported and exported expensive sucrose. The study found that the total sugar content of the product was 83 percent, with glucose and fructose being the two most present, with some positive findings being reported with the date extract being used in soft-drinks. Dates, natures candy, may well be an up-and-coming sweetener ingredient to keep an eye out for. NutritionInsight has extensively reported on the potentially harmful effects sugar has on our health, from reducing fertility and in contributing to levels of negative emotions, such as depression and anxiety, as well as the role of sugar and high corn fructose syrups in causing an obesity and diabetes epidemic. In light of such health claims, and due to other factors, the UK has implemented a sugar tax on soft drinks in the UK, which has forced key suppliers to reformulate their recipes in ways that cut-down sugar whilst retaining the tastes that consumers enjoy. Our sister website, FoodIngredientsFirst, has reported widely on the implementation of the tax.